What We Ordered: Half-Dozen Bagels (3 Cranberry, Honey-Wheat, Cinnamon Sugar, Blueberry); Nova Lox Bagel (on Sesame Seed Bagel), Turkey Sausage and Cheddar on Asiago Cheese Bagel, Strawberry "Schmear"
I realized that my website was severely lacking in the breakfast department - for some reason, I just don't really go out to breakfast that often. Usually I prefer to eat breakfast in my barely-awake stupor, so the idea of driving somewhere and having to use my debit card seems a little intimidating in the morning. But since I don't have class on Fridays, I decided to drag my sister out of bed and force her to go out with me. 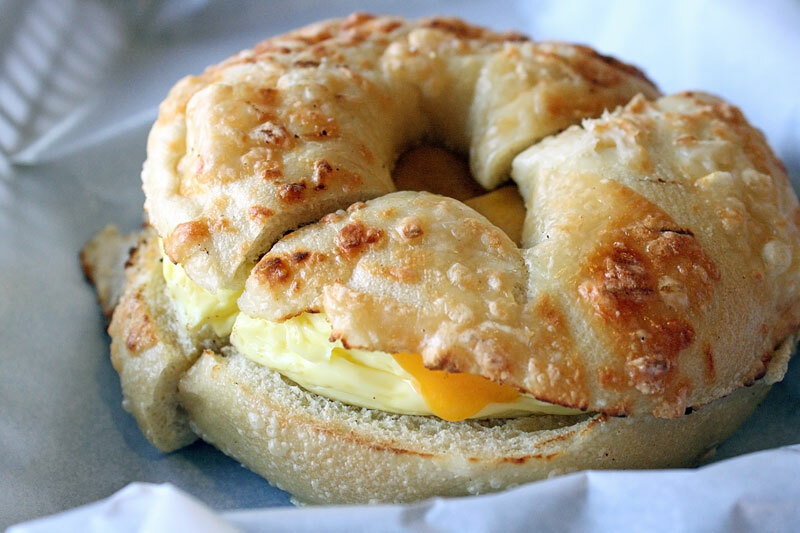 Egg Sandwich -- the bagel = top notch. I commented that my sister's bagel looked skinnier than mine, but she said that she actually liked it because it felt like the sandwich was well-proportioned. The egg was a little flavorless, but the texture was okay. It was served warm, and prepared quickly, so overall a pretty good choice for a nice little breakfast. 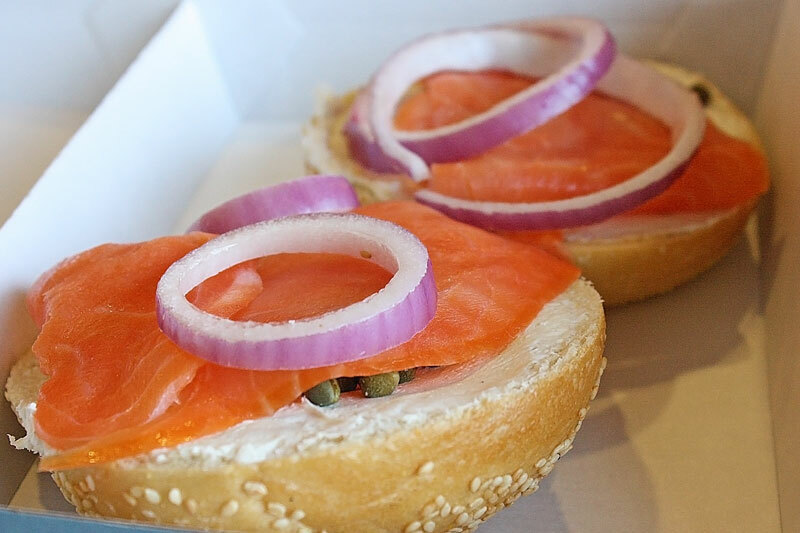 I decided to be adventurous and go for the lox and bagels (even though my fear of Utah fish still exists...). It was probably the most expensive sandwich on the menu, but it was worth it! First off, it was very filling, and I was only able to eat one of the bagel halves before feeling content. 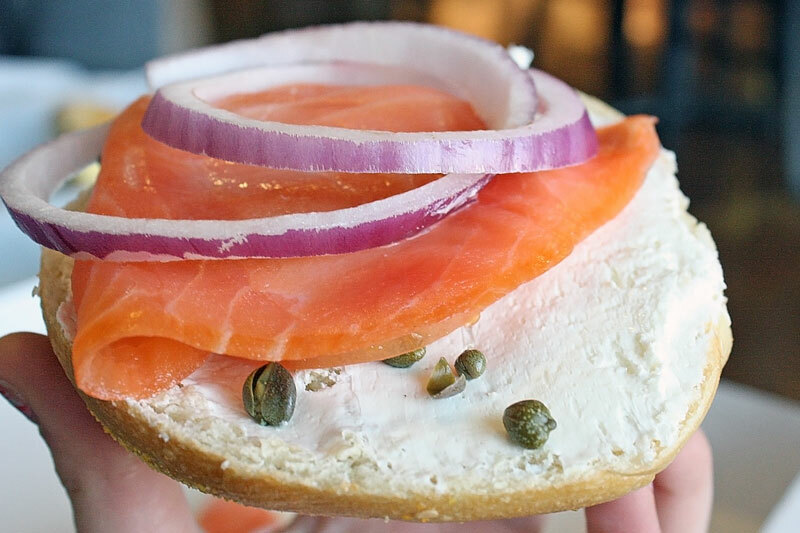 From my previous knowledge, the toppings on the bagel seemed pretty traditional - I loved the contrast of the capers, and everything tasted pretty fresh (though the onions were really strong). The smoked salmon itself was surprisingly good - not too fishy, sliced thinly, tender and soft. I loved the sesame bagel with it - a nice savory flavor that did not detract from the creamy mixture of cream cheese and salmon. I brought home my second half to Owen, who ate it for breakfast the next day, and he said it was still fresh and surprisingly good (he'd never had lox before). Malawi's Pizza & Our Winner!